Despite compactness, can support large canvases. Mast raises to 82" (slides into box frame for storage). Suitable for tabletop. Wedge-lock system stabilizes canvasses. Tray has extra shelf. Legs fold flat. 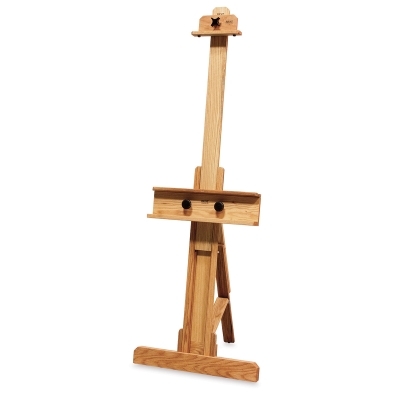 Best's Medium Chimayo has an adjustable and collapsible mast that slides in a rugged box frame. It can be raised to a full height of 82" (208 cm). When collapsed, it stands only 52" (132 cm) high, suitable for a table top. For storage, the mast drops down into the frame, and legs fold flat. It is supported by a T-frame base, which makes it slightly less stable than the full-size Chimayo, but more compact for storage. Maximum canvas height is 66". Ships fully assembled from the factory by UPS.